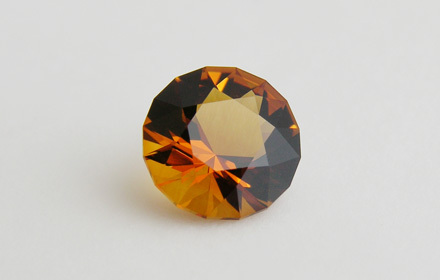 Weight: 0.80 ct; size: 6.59 | 6.50 | 4.02 mm; shape: round; colour: medium reddish orange; strong; clarity: eye clean; cut: excellent; treatment: heating. Probably heated amethyst. Very clean specimen; excellent brilliant style cut. Source: Jeffery Davies, Jeffery Davies Fine Jewelry & Gemstones.